The wallpaper From Our House to Bauhaus – Occupy Modernity, is an image-essay that inhabits and inverts the layout and title of Tom Wolfe’s book From Bauhaus To Our House. The wallpaper organizes the book’s pagination into a grid, presenting its original images as white spaces and then converting its textual spaces to image in order to visually propose an argument about the forgotten potential of Modernity to improve everyday life. 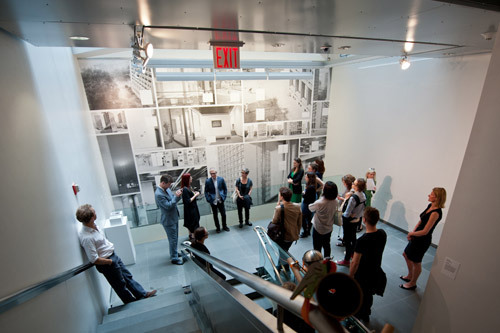 The Artists used images of the NYU Silver Towers Housing Complex from their archive to recall this potential within Modernist architecture – its relation to the city and the ways we want to live – as enacted and understood by the city’s inhabitants, rather than as defined by architectural planning or Wolfe’s authorial critique. The work was realized for the exhibition “Our Haus” at the Austrian Cultural Forum in New York City in May of 2012.